The American Legion Post 533- 3pm. Fried turkey dinner. Side dishes and desserts are welcome but not required. Bastrop Church of Christ- 287 Hwy 20 in Bastrop. Call (512) 303-4597 to RSVP. Baxters on Main- 11am-3pm, located at 919 Main Street in Bastrop. $25.95 Adults, $15.95 Children 5-10, under 5 eat free. Call (512) 321-3577 to make your reservation. First Assembly of God- 609 Pecan Street in Bastrop. Potluck meal, bring a dish. Call (512) 303-5442 for more info. First United Methodist Church- 12pm, Fellowship Hall, located at 1203 Main Street in Bastrop. Call (512) 303-5072 to RSVP. Hyatt Regency Lost Pines Resort and Spa- 11am, located at 575 Hyatt Lost Pines Road in Cedar Creek. Call (512) 308-4860 to make your reservation. 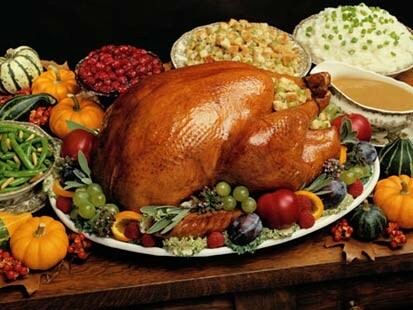 Thanksgiving Brunch is $49 for adults, $24 ages 4-12, and complimentary for children ages 3 and under. Maxine's on Main- 12pm-4pm, located at 905 Main Street in Bastrop. Buffet style. Adults $18.95, children under 12 $10.95. Call (512) 303-0919 for reservations. Primera Baptist Church- 12pm after the service on SUNDAY, Nov. 27th, located at 306 Paul C Bell in Bastrop. Call (512) 303-2082 to RSVP. VFW Post 12104- 1128B Hwy 21 East in Bastrop. Turkey and trimmings. Football on TV. Donations only. Call (512) 332-2115 for more info.